Science communication is surprisingly diverse, a necessity in order to be effective. “Scicomm’ers” engage diverse audiences (e.g. students, stakeholders, other scientists) using diverse methods (e.g. journals, social media, town hall meetings), but communicators themselves come from a variety of backgrounds, including ages. Over the past year I’ve been inspired by one of the next generation’s science communicators, 10-year-old Henry Foster of Arkansas. His message: Arkansas needs a state fish, and it should be the Alligator Gar. The campaign is appropriately named…#GARkansas. I had the privilege of chatting gars with Henry via Skype this spring, and we’ve also corresponded through his parents and uncle (they’re of course integral members of the #GARkansas team). Henry’s already a natural when it comes to science communication, tailoring his message to different audiences across different media; he’s talked #GARkansas with local TV, newspapers, a podcast, and an assembly at his elementary school. Last week he successfully submitted a House Resolution to make Alligator Gar the state fish! Here’s a brief Question & Answer we had last month, and we’ll follow up on the effort again in 2019 when Arkansas will be voting for its new state fish…of course we’re hoping it’s the Alligator Gar! Solomon: Why do you like the Alligator Gar? Henry: I love the Alligator Gar because they are ancient fish, and whenever you look at one, it feels like you are looking at a living dinosaur. Solomon: Why do you think the Alligator Gar should be the state fish of Arkansas? Henry: The Alligator Gar should be the state fish of Arkansas because it has been here longer than the bass has, and most people of Arkansas can recognize this fish easily. And, no one else has a gar as a state fish, and I want Arkansas to be unique. Solomon: Did you talk to the TV people differently than your school assembly, or was it the same message? How did you feel talking to those groups? Henry: I tried to talk differently to grab the attention of different audiences. When I talked to kids, I talked more about how big the gar is, has sharp teeth, and lived with the dinosaurs. When I talked to grown ups, I focused on the political side, like the fact that we are one of only 4 states without a fish, and that we don’t want to copy the state fish of other states. And EVERYONE loves that the Alligator Gar is fierce like the Arkansas Razorback! When I talked to a camera, I was less scared because I didn’t know if anyone would actually watch it. I was much more nervous talking to the assembly at school, because I was standing in front of 700 kids, so I KNEW that people were watching & listening. Solomon: How did it feel to write the House Resolution? How do you feel now that it’s been turned in? Henry: It felt marvelous to be able to write a resolution that would be read by dozens of Arkansas representatives and by the governor. I kind of feel relieved by turning in the resolution because it was one more step toward the final goal. Solomon: What has been the response from the Representatives, and what are your next steps? Henry: All of the Representatives were so supportive when I sent the resolution. I have several events that we have been planning to raise awareness about the Alligator Gar, like the stand we got in the Fayetteville farmers market next month. 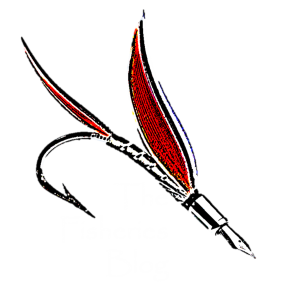 Solomon: What would you like Fisheries Blog readers to know about #GARkansas? Henry: After my presentation to the assembly at school, I was so surprised that other kids kept coming up to me and were giving me advice about where they have gone gar fishing. It would be nice if we could educate kids from a young age on how to catch and release rather than just hunt these great creatures. You can learn more about the #GARkansas effort on Facebook and Twitter, and help support it by signing Henry’s petition (they just reached 2500 signatures!) Best regards to Henry and his #GARkansas team! *Special thanks to Melissa Foster for facilitating our communications! Thank YOU Henry, not just for the fintastic #GARkansas swag, but for your scicomm efforts! This is an important reminder. I love you article so much. “BREATH OF FISH AIR” article picture is so so beautiful.